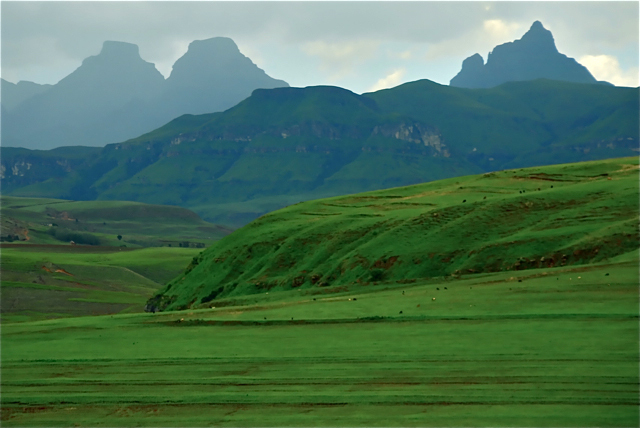 The Central Drakensberg in KwaZulu-Natal, South Africa is one of the most beautiful places in the world. 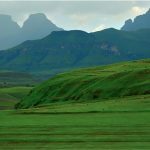 The peaks of Cathedral, Cathkin, Dragon Peaks, and Champagne Castle jut out from the plateau ridge over 12,000 ft into the air. The plateau edge falls away in a sheer drop onto an undulating hillside. Here the fertile soils are dotted by the colors of the ripening crops under the centre pivots. The climate here has unique characteristics. The air is clean, crisp and fresh to breathe. The sheerness of the mountain allows heat to rise up against the warm cliffs during the day and cooler air to feed down at night. The winter sees snow on the tops that feed the crystal clear mountain streams. In the valley the winter days are mild enough to go for a walk but winter nights are suited to log fires, companionship and a glass of wine. The soil is deep and fertile and the land is gently undulating. With steady summer rainfall, nature responds with vigour. We farm here and we have a passion for it. In 2008, we decided to take this passion for farming and blend it with our passion for wine, and as a result we planted some vineyards. With such a climate, in such a unique environment, it was sure that we would find a way to make wines of distinction. Nothing less will do as our heritage is deep and respectful. We welcome you to Cathedral Peak Wine Estate where we make wines with a clear sense of place.